Why don’t you try a food you thought you hated? I recently discovered that I don’t dislike broccoli as I thought I did but rather enjoy it. I’m still rather disturbed by this newfound knowledge. Maybe it was a fluke? Why don’t you take some clothes to the tailor and get them appropriately fitted? It is so nice to see somebody at work or on the street when their clothes are impeccably well done. I finally found a pair of Bonobos pants that fit me properly around the waist — why the constant struggle? — and I bought them extra long so that I can wash them a few times and then hem them at the proper length. Clothes are not one-size-fit-all, people! Why don’t you wear a ghost costume to work and proclaim exasperatedly that it is a couture gown? I can’t think of anything more fun than swooping about in a bed sheet, telling others that, “It’s Valentino, darling!” Maybe that’s just me? Why don’t you buy some crumbling old house in your town and fix it up? It’s marvelous to own a structure with character, not some horrible cookie cutter with hollow core doors. Hollow core doors are the very end of civilization. That’s not an exaggeration. It’ll take ridiculous sums of money that you probably don’t have, but you’re probably going to die, so spend, spend, spend! Why don’t you go shopping for a nice pair of dark wash jeans that fit you splendidly? Karl Lagerfeld once said something like, “You’re always chic in a white shirt and a dark pair of jeans.” It’s quite true. I’ve worn this ensemble to fine restaurants and to fast food dumps without feeling out of place. Elegance is not at all hard to cultivate if you have good pieces to dress yourself with. Go shopping, reader. 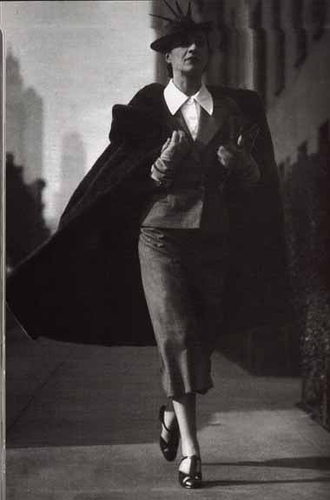 Tags: advice, Diana Vreeland, Fashion, food, inspiration, Why Don't You? I know I should try Okra again I feel guilty for not but it’s SLIMY! I want to go the tailor but I don’t go anywhere, I see what your saying though. Okra is weird, I’ll agree with you on that! If I don’t think about it, I can eat it without too much gagging. EWWW I don’t think I can! I know I must be brave! MOUTH CLOSED shaking head like a child no no no lol! Maybe fried Okra…. can I try it fried? Everything’s better fried, go for it! Ok fried I’ll do it! I’m now curious how that’d be…I may attempt it.